This review of Lost Mine of Phandelver marks our fourth look at Dungeons & Dragons, Fifth Edition since the release of the D&D Starter Set. 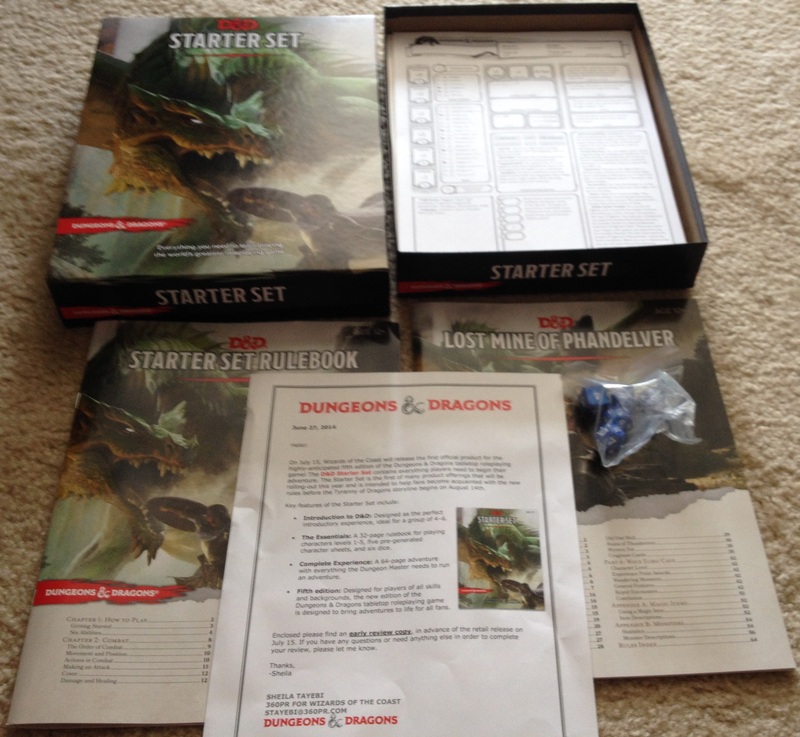 We’ve given you an unboxing and done reviews of both the D&D Basic Rules and the D&D Starter Set Rulebook. 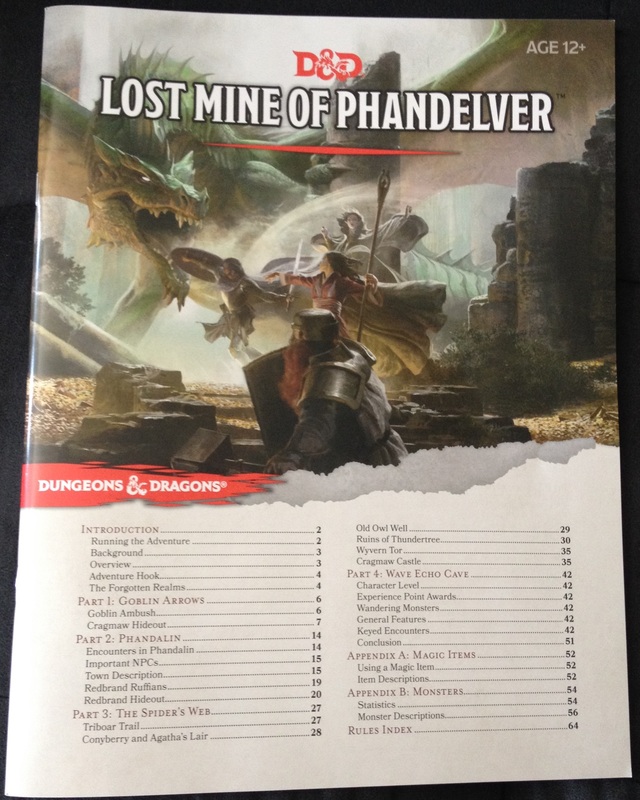 Today we’ll be finishing our coverage on the D&D Starter Set with a look at Lost Mine of Phandelver, the second book in the set, which is a full campaign that takes your characters from Level 1 through Level 5, in addition to also being a bit of a Dungeon Master’s Guide and a Monster Manual. Even if you just went for the D&D Basic Rules, because they were free, you’ll want to pick up the D&D Starter Set for the dice and the Lost Mine of Phandelver book simply because of the monsters and adventures it contains. Lost Mine of Phandelver really is worth the cover price of the D&D Starter Set and then some, and it is time to show you why. 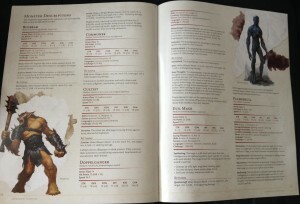 Because the D&D Starter Set is geared towards people new to not just D&D, but gaming in general, the first few pages of this book talks about how to DM properly and gives some quick advice on how to run the game smoothly. Now, the adventures contained in Lost Mine of Phandelver are written in such a way as to help a budding GM keep from getting confused or lost, which is nice to see. It’s not as well done as Shadowrun Missions in this regard, but really, what is? Still, I could probably give this book to my wife, who has never played a tabletop RPG in her life, and she could run an adventure without a lot of complications. It’s also worth noting that the hand holding becomes less and less with each adventure in this collection, as the book wants/lets the DM feel more confident in their abilities. 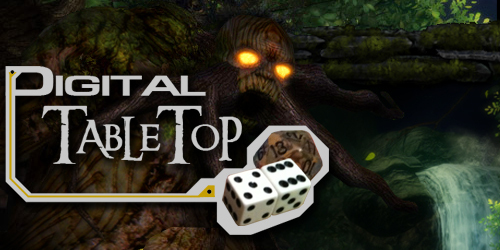 A good example is with the first adventure, where everything is laid out for the DM, like specific XP point awards and when to distribute them, and in later, more complicated, adventures you’ll have to look up the XP award in the Monster Manual. There’s also a mix of straightforward dungeon crawls, fetch quests and even sandbox style mini-adventures, so DMs and players alike get a sampling of various adventure tropes. It’s very well done! Lost Mine of Phandelver‘s adventures are divided into four parts. Notice I didn’t say four adventures, and that’s because part three is a sandbox piece containing many possible short quests. So yes, you are getting a full length campaign in this book, for a fraction of what most supplements for other games cost. That’s awesome. Part One is called “Goblin Arrows,” and it’s very definitely meant to be an introduction, not just to the campaign, but 5e play in general. Characters are escorting some much needed cargo to the hamlet of Phandalin when they are attacked by Goblins. This attack leads the characters into a small dungeon crawl of about eight locations. Goblins, Bugbears and wolves abound here, and by the time you are done, your characters will be Level 2, have made an important ally and will have fully vested themselves in the campaign. I should also point out here that you only need 300 XP to hit Level 2 in Fifth Edition. Compare that to D&D 3e, where you needed 1,000, or AD&D Second Edition, where it ranges from 1,250 to 2,500 XP to hit second level. Whether that’s good or bad is entirely up to you, but it is worth mentioning the huge change in leveling up now, rather than have you get shocked by it later. Regardless, “Goblin Arrows” is a really well done short adventure that teaches the basics of Dungeons & Dragons to the GM and players alike, and for a starter adventure, there is a lot more story and depth to the piece than we normally see, especially for a dungeon crawl. Part Two, “Phandalin” includes a slightly larger dungeon crawl (twelve locations), but also introduces players to the importance of towns and NPCs. There are several important locations and about a dozen potentially recurring NPCs in Phandalin, and this section will be just as much about roleplaying as it is hack and slash combat or dungeon exploring. Getting to know the residents and locations of Phandalin helps set up Part Three, where characters have a chance to take part in numerous short quests to get some extra experience points under their belt. Some of the Part Three quests can be given out or started here in Part Two, and if players decide to go handle the subquests first, more power to them. Between Parts Two and Three, Lost Mind of Phandelver almost feels more like a video game sandbox RPG than a tabletop piece, and I mean that in a good way. Besides combat and town exploration, “Phandalin” also lets players really explore the role-playing side of Dungeons & Dragons. There are five different secret societies of sorts in Phandalin, and depending on how characters are and who they encounter, they might be asked to join one or more. Imagine the intrigue when one player joins the Harpers and another joins the Zhentarim. Suddenly you have a whole new level of interaction and conflict between the characters (but hopefully not the players). Do the characters keep their new allegiances secret, or are they upfront about the organizations that have recruited them? Maybe, just maybe, the party tries to play all of these groups for whatever they can get. Can they maintain that level of subterfuge? There’s a lot of great stuff here. As for the dungeon crawl, it’s a pretty straightforward piece, but you start to see the use of traps and secret doors here. The villain is a nicely unexpected plot twist, especially for newer or more casual gamers, and again, it’s nice to see that even the dungeon crawls in Lost Mine of Phandelver are more than straight forward hack and slash. You’re getting meat and roleplaying opportunities instead of just going from one room to another, rolling the d20. Part Three is “The Spider’s Web” and it’s a collection of all the Quests that you might have gotten pieces of in Part Two. This is the real sandbox piece of the campaign, as adventurers will probably only get a few of the options here. Some of these quests are as simple as exploring the local wilderness and letting the GM learn how to use random encounter tables. Others are more complex and involve sacking a Hobgoblin castle or even doing battle with a young green dragon. 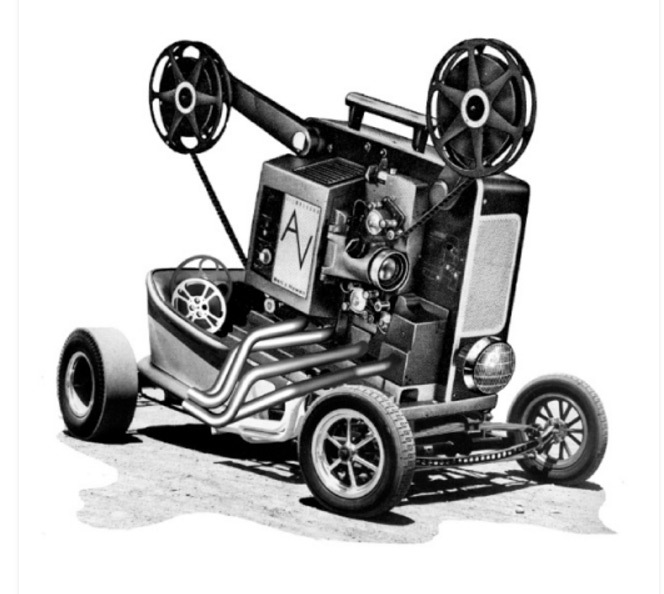 A druid ally can also show up in one of these, giving new gamers a taste of something other than the four included classes. All of the adventures are fun and the quests have story based roots, so they are just cheap XP gains like video game style grinding. There are roughly half a dozen options here, and if your players actually spend time exploring the locale of Phandalin, they should be Level 4 by the time they are ready to move on to the final part of the campaign. Now, Lost Mine of Phandelver is more than just a campaign. You also get two pages of magic items, which consists of classics like the Ring of Protection and Gauntlets of Ogre Power. You also get a mini Monster Manual. This consists of two pages of descriptions on how to read monster stat blocks, along with eight pages of things to kill. There are twenty-seven creatures in all, each one perfect for low level characters, like zombies, owlbears and giant spiders. Overall I have to say Lost Mine of Phandelver is fantastic. 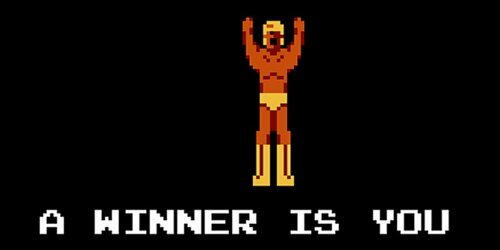 Not only is it a great way to introduce new gamers to Dungeons & Dragons, but it’s a very solid campaign in its own right. In fact, it’s one of the best adventure compilations I’ve seen this year. So the fact you can get this, a mini PHB, a full sort of dice and more for a little over twelve dollars on Amazon.com – why on earth wouldn’t you get this for you and your friends to enjoy? 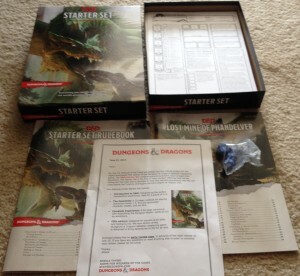 Even if you don’t purchase anything else for Fifth Edition D&D, the D&D Starter Set is a fantastic value that will last you through multiple gaming sessions. I’m pretty ecstatic with it. Is it perfect? No, of course not. I still prefer AD&D Second Edition as my go to version of Dungeons & Dragons. Others will prefer 1e, 3e, or even the B/OD&D. It’s all good. Still, it’s hard not to recommend this to any gaming fan, simply because it’s a high quality product with such a low price point. Lost Mine of Phandelver is a wonderful example of how to create something for people new to gaming who might be intimidated by the number of books, dice and character creation options these games have. For veterans like myself, it’s just a fun time for what it is. That’s all you really need, am I right? I really do like what they did with the campaign portion of the boxed set. It’s a great starter campaign and much better than the level 1-5 start adventure I picked up on a whim a few years back to give fourth ed a spin. This is leaps and bounds ahead of that. Good variety of monsters, great NPCs and lots of little bits of political intrigue to toss around. Definitely recommend it. Good write up. My go to DnD will always AD&D 2nd ed as it is what I grew up playing. I’ve tried 5th edition and its fun but I’m slightly concerned at the tabletop elements which have crept in making it more of a board game than a roleplaying game. I ran this for about 6 hours for my son and my wife. They’re about a third of the way into it. If you have inquisitive players who really like to get involved they’re going to have a blast and will level fairly quickly. We actually are using the 5 template characters that came with the set who all have personal ties in some way to the area the adventure is set in so they’re all running around trying to help each other get their personal goals completed while still trying to advance further down the adventure. It’s been a blast and really works well as an introduction to the new rules along with the Forgotten Realms and throws a really good variety of monsters at your players from the start so they don’t get too bored. 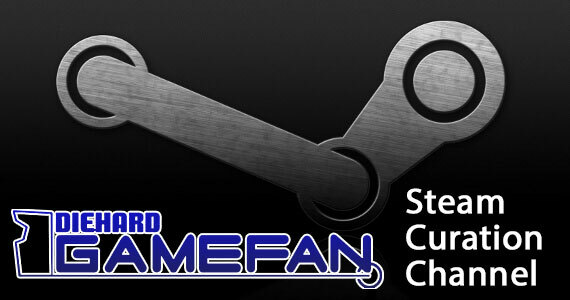 I’m thinking about running it for DHGF staff actually.